Just ran the sample dungeon. My first time DMing something and I was shocked how simple it is to run! Even improvised NPCs and created some characters I want to keep. Fungal Star Goblin twins Mooki and Rooki are going to have to come back. Awesome! Please keep me updated on Mooki and Rooki. I love to hear how other people use the star goblins. Thanks for playing! 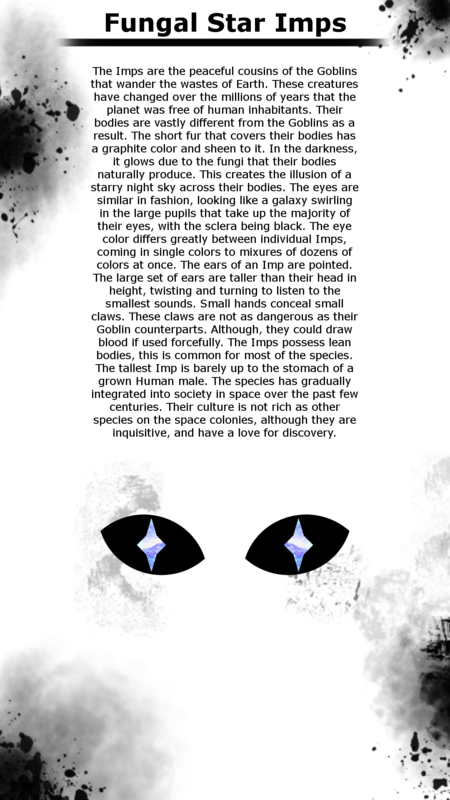 Decided to differentiate Mooki and Rooki from the Goblins by making their race a cousin of the Goblins called Imps. They will run a shop on the Mars station (Player home) while their porpoise parents are away, causing mischief and aggravating my scientist party members. Amazing! Do you mind me sharing this on my blog? and do you have a website or way you'd like to be credited? Sure, share away. My name can just be credited as Viscole. Thats the name I use on most other sites. And no website, sorry, I'm just a little college student trying new things.